Based on reviews from 14 experts and 3,289 users. Learn how our rankings work or see our guide to Adidas Tango football boots. Updated Apr 2019. Staying on top of the soccer game after several decades, Adidas still manages to come up with new silos and expand to new markets to conquer. Currently, the brand has several silos under its name offering several football boot versions for different courts. Bringing the premium football experience from the pitch to the streets is what the Adidas Tango football boot collection is meant to do. The construction of the boots under the Adidas Tango lineup is similar to its stadium counterparts except for its soleplate. The soleplate of every Adidas Tango football boot has been specifically designed for street, indoor or turf grounds. Each Tango shoe brings with it a combination of technologies dependent upon which collection it is featured in. Some technologies from the brand have been a constant feature for the Adidas Tango football boot line-up while others are limited to a specific collection. Spanning from the upper, the midsole to the soleplate, these features aim to maximize the Adidas Tango football boot experience. Giving way to a one-piece construction, Primeknit is digitally calibrated to provide optimal boot flexibility for the wearer. This ‘fused yarn’ technology is lightweight and brings stability to the football boot. An example of Adidas Tango football boots that contains Primeknit is the Predator Tango 18+ Trainers. Techfit is a technology that’s been applied to several of the brand’s products; from apparel to football boots. Although it works differently for each, the concept has been consistently about creating a flexible yet supportive feel for its users. When used in footwear, Adidas Techfit creates a snug, sock-like fit that brings support. Acting as an upper, its design is meant to move and flex according to the natural movements of the user’s foot. Adidas Tango football boots that feature the Techfit upper is the Adidas X Tango 17+ Purespeed Turf as well as the artificial grass and firm ground version of the Adidas X 17+ Purecontrol. Perhaps the most unique-looking Adidas Tango football boot comes from the Nemeziz line. Shoe models under this collection feature the 360 Agility Bandage System which features Torsiontapes. The construction is inspired by medical bandages that are used by athletes and performers before a game or performance. 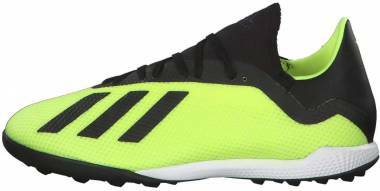 Shoe models under this line include turf football boot and indoor football boot versions of the Adidas Nemeziz Tango 360+ Agility shoe. Boost is part of Adidas’ cushioning system. It is a TPU-based material which promotes shock absorption by compressing under pressure and rapidly bouncing back to shape. With this set-up, Boost produces a high energy return during play. Adidas Boost has been incorporated into several collections including the Adidas Ace, Adidas X as well as Messi’s line. Adidas Tango football boots with this technology include the Adidas Ace Tango 17.1 shoe and the Adidas Predator Tango 18+ IC. Made out of rubber, Adidas’ Torsion outsole technology has a lightweight construction. This type of structure allows for flexibility without compromising the stability of the shoe. Acting as a bridge between the forefoot and the heel, the Torsion system prevents unnecessary flexing in the arch by providing a platform for the foot. Several Adidas Tango football boots including the Adidas Nemeziz Tango 17.1, the Adidas Nemeziz Tango 17+ 360 Agility Indoor shoe and the Adidas Nemeziz Tango 17+ Turf boots. Adidas Tango football boots concentrate on turf, street style, and indoor boot offerings. 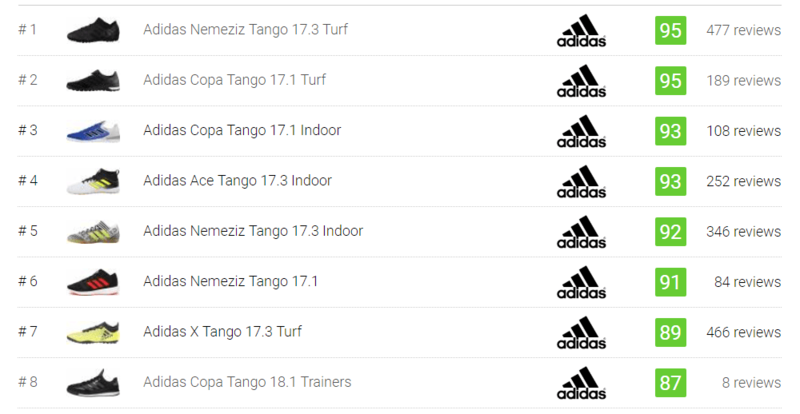 The Tango collection is part of the brands’ current silos namely Adidas Ace, Adidas Predator, Adidas Copa, Adidas X and Adidas Nemeziz. The Adidas Ace collection initially launched in 2015. Although the new Predator collection ultimately replaced it, the silo has had its time in the football spotlight before retiring. 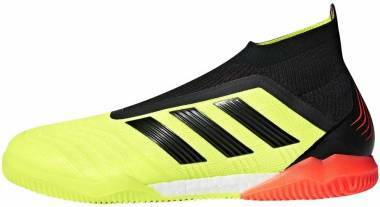 Adidas Ace Tango 17.1 Trainer - Featuring a black upper with red accents, the shoe was created with the small-sided game in mind. It brings with it a one-piece design and a Techfit collar. The midsole construction is thick and makes use of the brand’s Boost technology all the way to the front of the shoe. The outsole for this Adidas Tango football boot is made of rubber for traction. Adidas Ace Tango 17+ PureControl Red Limit - Part of the Red Limit offering, this Adidas Tango football boot has graced the foot of the celebrated footballer, Paul Pogba. 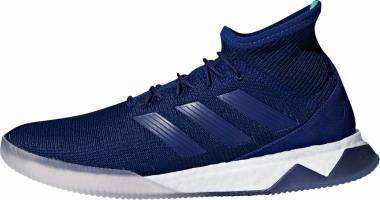 With a laceless construction featuring a Primeknit upper, the Adidas Ace Tango 17+ Purecontrol shoe is made for a smaller pitch. 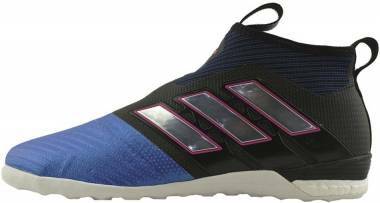 Similar to other indoor football shoes or street models, it has the Boost midsole technology which creates a high energy return during play. Another Adidas Tango football boot offered under the Ace collection is the Adidas Ace Tango 17.3. Using the act of wrapping bandages before a performance in sport or dance as an inspiration, the Adidas Nemeziz line introduced a unique look to the market during its release. It is a fresh take, not just in the looks department but also in boot technology. The line focuses on improving agility as well as stability. This innovation gave way in introducing technologies such as Agilitybandages and Torsiontapes. 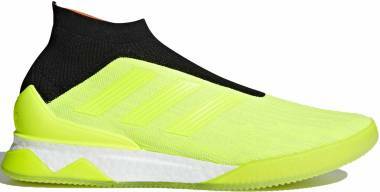 Adidas Nemeziz Tango 17.1 - Bringing with it more of a sneaker-like feel rather than the feel of an indoor boot, the Adidas Nemeziz Tango 17.1 is not a performance-oriented shoe. This Adidas Tango football boot is geared towards casual wear. 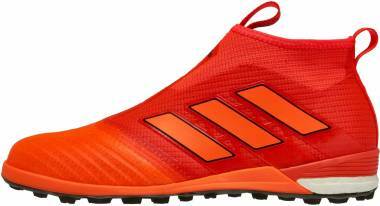 However, this boot delivers innovation with the use of Torsiontape technology. This type of construction locks down the foot while providing a great fit. Agilityknit has also been incorporated. This material, on the other hand, offers a lightweight feel to the shoe. 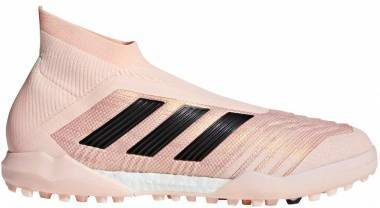 Adidas Nemeziz 17+ 360 Agility - A laceless Adidas Tango football boot which belongs to a premium price range, the Adidas Nemeziz 17+ 360 Agility shoe has been offered in several colorways. 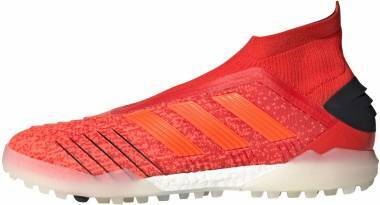 With a similar construction to the Adidas Nemeziz 17.1, it features Agilitytapes as well as Agilityknit technologies to the upper bringing a soft sensation to the boot. A Torsionframe outsole also provides enough flexibility to the shoe. The Adidas Nemeziz Tango 17.3 Indoor and Turf boots are also offered under this silo. As one of the most popular boots of the brand, the Adidas Copa collection has been with Adidas since the early 80s. Being in production for 30 years since its last update, the brand decided that it’s high time to reintroduce the Copas with some updates in 2017. 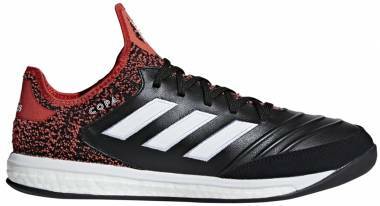 Copa Tango 17.1 - Adidas created an indoor and turf football boot version of the Copa Tango 17.1. It has a kangaroo leather upper which hugs the foot and brings about an excellent comfortable fit. An apparent update to the boot is the compression fit tongue which extends to the soleplate while wrapping the foot. For the outsole, a Sprintframe technology has been integrated into the shoe as well as an Ortholite sockliner. 2017 was the year the brand decided to bring back a classic and reimagined the legendary Adidas Predator football boot. Incorporated into this silo are several technologies including Boost, Purecut Laceless system, and Sockfit which gave the iconic shoe a modern twist. Sported on the pitch by Paul Pogba and Mesut Ozil, this release made a splash in the football world. Predator Tango 18.1 - As part of the newly revived Predator silo, the Adidas Predator Tango trainer premiered with the rest of the line’s debut football offerings. No stranger to Adidas’ Boost midsole technology, this Tango model did not shy away from it, providing a responsive feel to the boot. The shoe also had a mid-top collar with a looser fit - a feature unique to this shoe in this particular collection. Predator Tango 18+ - Purely designed for casual wear, the Predator Tango 18+ boot banks on comfort. This Adidas Tango football boot features a Primeknit upper that hugs the foot, provides support but still maintains a lightweight feel. To add to comfort, the Boost midsole is incorporated as a cushioning system. Finally, a rubber outsole is used for traction. Replacing four silos during its release, the Adidas X collection had some big shoes to fill. Their release in 2015 did not disappoint. In 2018, this collection is running in their third year with no signs of slowing down. X Tango 17+ Purespeed IN - Designed for the small-sided game, this laceless Adidas Tango football boot brings with it an excellent fit using a Techfit upper. This boot also creates enough stretch without losing security in locking down the foot. Although the material in the upper seems quite thin, it still brings a unique feel to the ball. A rubber outsole is used for traction on indoor courts. X Tango 17.3 - Another Adidas Tango football boot under the X17 line is the more budget-friendly model X Tango 17.3. Featuring a Techfit compression upper which creates a snug fit to your foot. Designed for indoor use, a rubber outsole has been used for traction has been used. Tango models including the X Tango 17.3 Turf boot is offered under this collection. What is the ‘Red Limit Pack’ of the Adidas Tango football boot collection? Released in 2016, the Red Limit Pack is a collection of Adidas Tango football boots sporting a red, black and white colorway and featuring some innovative cleats from the brand’s various silos (including the Adidas X, Adidas Ace, Messi, Adidas Copa and Tango collections). Ace 17+ Purecontrol - This model was released as the first football boot to have the Adidas’ Boost technology as its cushioning system. It also sports Primeknit and Techfit technologies. Messi16+ Pureagility - Designed for Lionel Messi, this cleat features numerous innovations such as Agilityfit, a Pureagility heel liner, and a Purecut sock system. Messi16.1 - In collaboration with Lionel Messi, this boot brings a second skin fit which creates closer ball touch and control. X16+ Purechaos - What differentiates this boot from the rest of the silo is its Non-Stop Grip technology which provides control in any weather condition. Copa 17.1 - Mixing traditional and modern elements into one boot, the Copa 17.1 features a kangaroo leather upper, a lightweight feel and a Sprintframe outsole. Copa Tango 17.1 TF - With a kangaroo leather upper, this boot brings comfort, excellent fit as well as a great ball touch in turf courts. Ace17+ Tango Purecontrol - A laceless football boot which brings in a Primeknit upper and vamp. 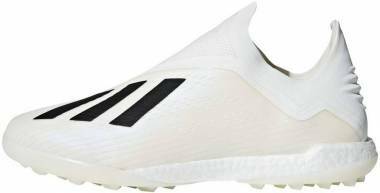 Ace17.1 Primeknit - Primeknit and Purecut technologies are used in this boot’s construction which ensures foot lockdown while providing a comfortable feel. 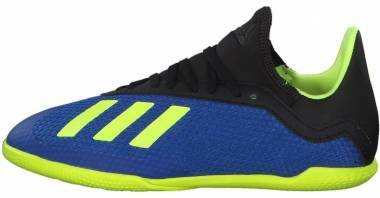 Ace17.1 Tango Street - This street shoe uses Primemesh upper, Techfit technology as well as Boost. Ace17.1 Tango TF - Providing a sock-like fit, this boot has a comfortable fit and uses an anti-abrasion upper which aids durability. Can an indoor Adidas Tango football boot be used as a sneaker? Yes, several indoor boot models can serve as sneakers. 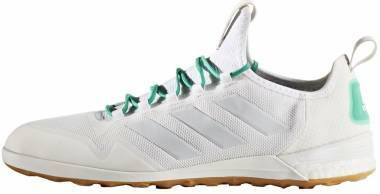 The Adidas Nemeziz Tango 17.1, Adidas Spezial and Adidas Ace Tango 17.1 are some of the shoes that can pass as sneakers. What are the things to take note of when buying indoor football boots? When buying a pair of new indoor football boots, there are a few things to consider. While these tips are good for indoor soccer shoes, they are also applicable for boots for different court types including turf, artificial grass, and soft ground. First, comfort is paramount when choosing your shoe. A way to ensure comfort is by selecting the right shoe size. Some users check the shoe’s fit is by sticking one’s thumb between the heel and the back of the shoe; if the thumb fits perfectly, it means that the boot is the right size for them. Another helpful way is knowing the general feel of the majority of users. Your regular shoe size will not work with certain silos at times for various reasons. You can find this out through an easy search on the internet. Expert reviews and websites such as Runrepeat.com would usually mention the recommended sizing of the indoor cleats. Another element to take note of is the price. There are several choice options to choose from every price range coming from several football brands including Adidas, Nike, and Puma. Most of these prominent brands offer cleats that are categorized in three to four price categories: the high-tier which is the most expensive one, the mid-tier which is rated between the high-end and low-end models and lastly, the low-tier which has the most budget-friendly rate. Choose a boot that stays within your budget, or if you feel like splurging, it should be worth the money. Another wise move is to check out outdated high-tier models that are put on sale or budget-friendly deals. In this way, you get to experience premium shoe value at a discounted rate. Weight is also another factor. Lightweight football boots can aid performance by helping the player to move faster. The ideal boot weight is 8 ounces which is also considered lightweight. Recent innovations by soccer brands have pushed the envelope with boots weighing around 5 to 6 ounces.